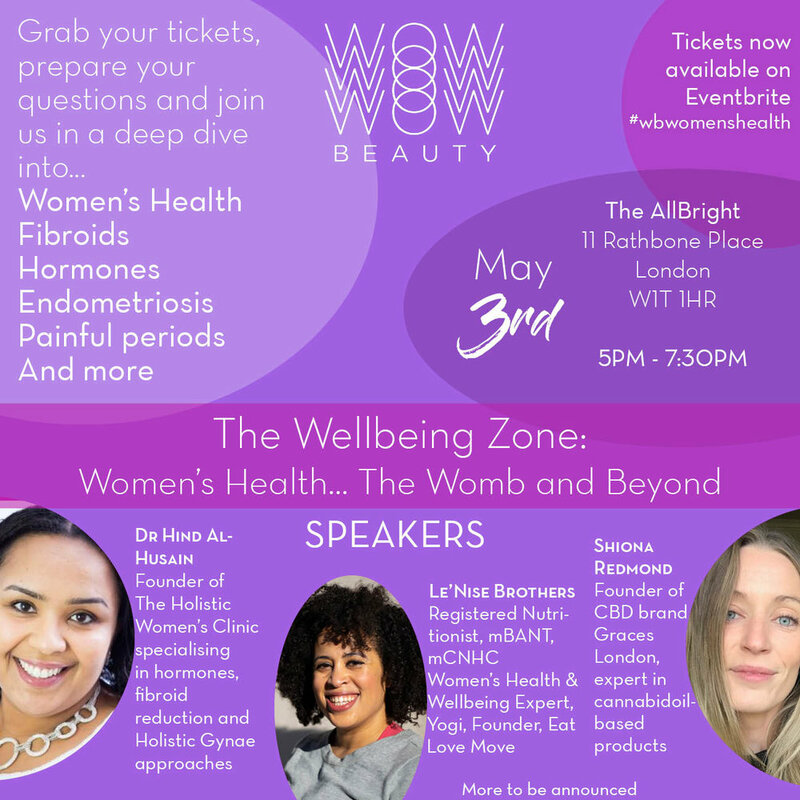 Denise Rabor, Founder of Wow Beauty, presents her next wellbeing event ‘Women’s Health:The Womb & Beyond’. At a time when women's health and well-being is drawing particular attention with campaigns to encourage cervical screening and issues of period poverty Denise has created this event to be a safe space to discuss concerns like Fibroids, Endometriosis, hormone health, perimenopause, menopause and more. The event will consist of a dynamic panel of experts including Dr Hind Al-Husain holistic gynaecologist & founder of The Holistic Womens Clinic, Le’Nise Brothers of Eat Love Move who is a registered nutritionist and women’s health & wellbeing expert and Shiona Redmond Founder of CBD brand Graces London (more speakers to be announced). Denise Rabor launched WOW beauty in 2016 as a way to celebrate inclusivity in the beauty and wellbeing sector. WOW Beauty is a holistic beauty and wellbeing e-zine designed to ignite the reader’s passion for beauty, wellbeing and wellness - in all its diverse forms. It also serves to inspire readers with its Founders Talk series. With stunning imagery, in-depth beauty and wellness features, product reviews and expert analysis, WOW Beauty is the comprehensive guide to looking and feeling empowered reminding us all that beauty is more than skin deep.